I think my favorite part about writing about iOS games is when a developer contacts me about their game which I had never heard of and I fall instantly in love. This just happened to me yesterday with Puzzle House: Mystery Rising by PugaPuma. I hadn’t heard of the game before, even though it’s been out for a little while already. But once I started playing, I couldn’t put it down until I completed it. Puzzle House is a 3D puzzle game reminiscent of the Room series by Fireproof Games. 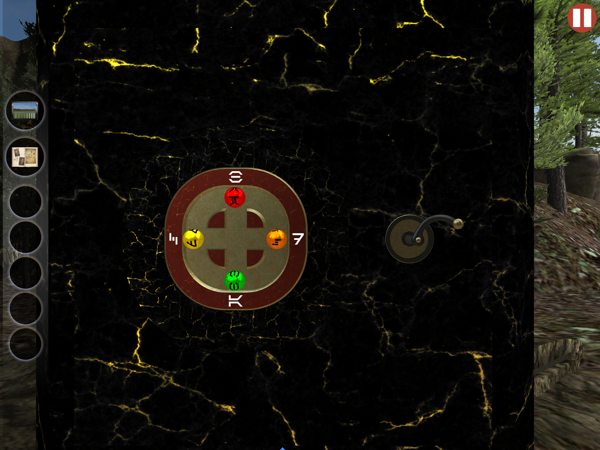 You find items, manipulate objects and solve puzzles to move on to the next one. But however Room-like the game is, it’s unique in its own right and stands out on its own. The most noticeable difference is that the entire game takes place outdoors instead of inside. Besides changing the tone of the game to a less brooding and more playful one, it also has the added benefit of giving you beautiful scenery to look at while you solve the puzzles. As much as I like room escape games, I get much more enjoyment out of similar games that take place outdoors. So for me, this was a huge hook. The game starts with you on your porch, enjoying a beautiful, relaxing day. You pick up your binoculars and look through them to see something odd in the distance. Before you know it, something is headed right at you! A drone crash-lands on your table. It’s now up to you to fix it and getting it working again. The first thing you’re tasked with is putting the broken propeller back together and reattaching it to the drone. It’s a pretty simple puzzle, since the game won’t let you put it together in the wrong order. So you can trial-and-error your way through it. In the very beginning, your biggest obstacle will be getting used to the controls. They’re not much different than the controls for the Room, but they still felt a bit awkward for the first few minutes. But I quickly got used to them and began solving puzzle after puzzle. After the first couple of puzzles, you do need to keep your eyes open more and take things into your own hands. The game has you focused on one object or area at a time. 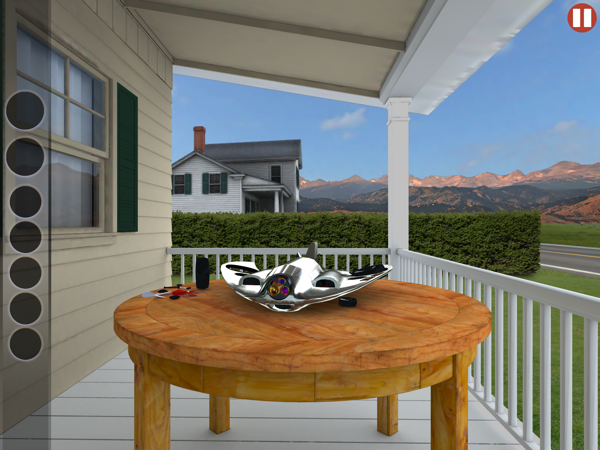 Even though you’re on a porch and can look around you, the game keeps you on the drone so there’s no mistaking what you’re supposed to be doing. Everything you need in the first area can be found right on that table. It’s a good way to ease the player into the game, learning to inspect every inch of the object so as not to miss a crucial puzzle element. 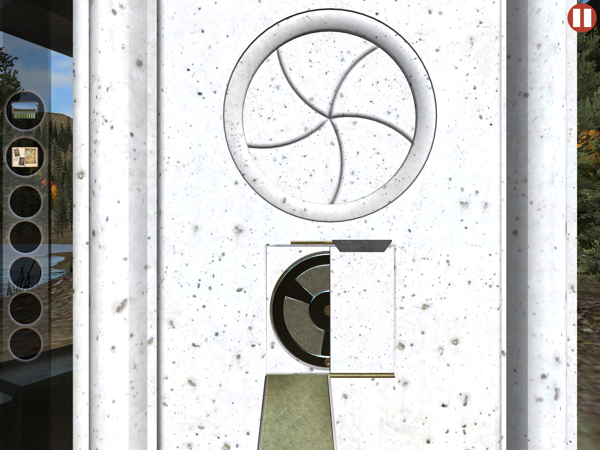 Later on, there will be some well-hidden switches and sliders, so it’s good to get used to looking carefully early on. When you do find something you were overlooking before, it’s a great “aha!” moment. I played the game on my iPad Air 2 and the visuals are just breathtaking. Most noticeable are the lighting effects. The drone looks like real metal with the sun glinting off its shiny body. 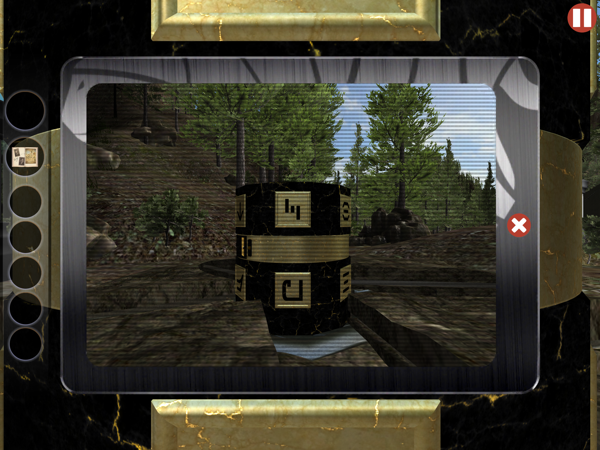 Later in the game, you’ll encounter a lot of gold-laced marble that I found mesmerizing. As you move the camera, the gold glimmers. I spent a good chunk of time just moving the camera back and forth to see this effect. It really gives the game a level of polish I don’t believe I’ve seen before in iOS games. The trees and landscapes, while not quite as realistic, are still very impressive. They trees gently sway in the breeze and still give me that unmistakeable feeling of being outside. Overall, I found the graphics to be very impressive. I’ve also been told by the developer that the visuals remain intact on older devices as well, not just the newest. So don’t worry if you don’t have the latest model. After fixing the drone, it will lead you to another area and watch you solve puzzles. It hovers around like a loyal little puppy, and you can see what it sees through a tablet in your inventory. Sometimes you need to use the drone and tablet to solve puzzles. I absolutely loved this aspect of the game. It felt so unique and fresh and I just want more of it. I can’t wait to see what they do with that mechanic in the future, as it seems the drone is your guide throughout the game. 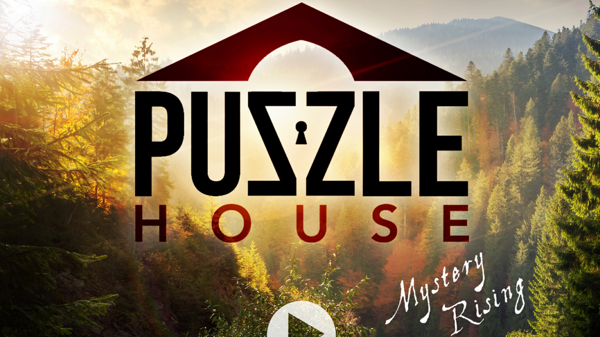 Mystery Rising is the first of three chapters planned for Puzzle House. So yes, it does end on a cliffhanger, leaving you wanting more and to see where this all leads. This chapter also takes you through only two locations. But they packed quite a few puzzles into those locations. Everything was done so well, and the mystery so mysterious, that you can bet I’ll be following every bit of news to find out when the sequel comes out. As much as I enjoyed Mystery Rising, there are some improvements I’d like to see in the sequel. The game gives you a journal after you complete the first area. It’s a very nice journal. It looks and feels like a proper book, where you can turn each page in real time. It’s quite impressive. There are clues in it, as well as some text in an odd font that gives it some character. There are also snippets of a story, but it’s hard to tell where it’s going just yet. You can tell a lot of love and effort went into making the journal feel really special. My only issue with it is that sometimes it makes things a little too easy. It often gives you the solutions to puzzles without you having to work much for them. Now, don’t get me wrong — I did not breeze through the game. There were plenty of times where I was stumped and had to fiddle around with things, look over everything to make sure I didn’t miss something. There’s definitely some challenge to be had here. But it’s inconsistent and sometimes I wished I had to either find the clues myself or that the clues would be a bit more cryptic. 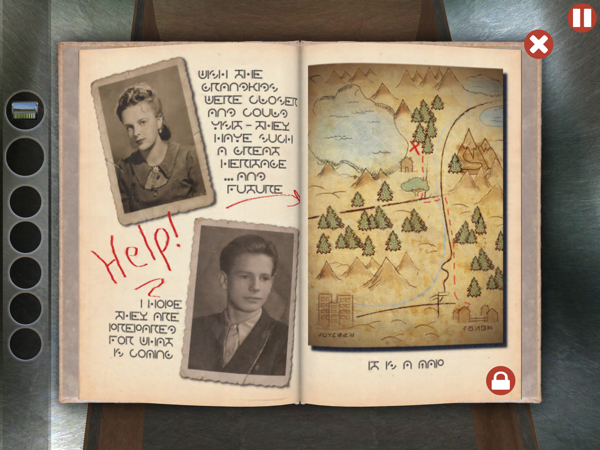 Having the journal pages and clues just automatically unlock when you gain access to a puzzle felt a bit lazy when the rest of the game is so well thought out. I still thoroughly enjoyed my time with the game and can’t wait to play the sequel. But I think a better clue system might push the game from great to to must-have classic. The other thing that I noticed is that objects in your inventory aren’t 3D like the rest of the game. While the controls as a whole are very tactile and built around touch screens, the inventory items are not. You can’t take them out and play with them in your hands like you could in the Room. It’s not a big deal, as it’s not necessary for solving any of the puzzles. But it’s noticeable when everything else is so polished. I mentioned this to the developer and they said that they do want to work on that for the sequel. So that’s something else to look forward to with the next chapter. If you’re already playing the game and need some help with it, try my complete step-by-step walkthrough. From the developers at PugaPuma, thank you for this wonderful review. We are glad you liked! It is humbling after so much work to know that someone else appreciates the final results. Thank you! Hi! 🙂 It’s clear you guys put a lot of love into the game, and I really did enjoy it. I hope this helps get the word out a bit, as I’m sure a lot of my readers would enjoy the game. I had a hard time finishing the review because I wanted to just go download the game. Every sentence made me even more intrigued & excited to play this game. It looks absolutely gorgeous. The graphics are blowing me away & the gameplay sounds well thought out. Great review on what looks like a great game. Heading to the App Store so I can enjoy this gem. Ok that opening scene is brilliant. Oh & beautiful. Wow! It doesn’t seem to be available on the AppStore. The download button you’ve provided usually works but in this case it takes me to appstore but nothing shows up. Please help! It’s only on iPad right now. They’re working on bringing it to iPhone. Is that what’s happening? That’s it! Thanks for letting me know. I thought the game was not available in my country. I can’t figure out the basic controls. How do you move back from a scene?